The minute I place an order on Amazon.com or some similar site, I spend the next few days on the edge of my seat, plagued by the question that has haunted mankind since the dawn of e-commerce: When is my order going to arrive? And because I usually pick the cheapest shipping option, that ramps up the excitement—and the uncertainty—of how soon my package will arrive at the front door. Package Tracker: Tap a button and Delivery Status Touch can show you where your order is and—more important—how soon it will arrive. Delivery Status touch removes that anxiety. Thanks to Junecloud’s app, I no longer have to fish through e-mails for tracking numbers or links for all my orders every time I want to check on the status of a shipment. Junecloud takes the capabilities of its Dashboard widget for OS X and adds a mobile component for the iPhone/iPod touch version. Install it on your mobile device, and you can check the status of your packages anywhere, anytime. You can enter packages from within the app itself—a process that will be much easier should Apple ever add copy-and-paste features to its mobile devices—or by entering package details on Junecloud’s Web site and syncing them to your iPhone. Delivery Status provides a list that shows you how many days until delivery. Tap an entry, and you get additional tracking and order info for online orders through Amazon, Apple, Adobe, and others. There’s even a View Map button which will launch the Maps application and show you where your package currently is according to your tracking info. It’s not real-time tracking, of course, but it can be fun to watch your package’s progress across the country. Delivery Status also allows you to delete deliveries from the list while maintaining a historical list of previously tracked packages for reference. The app has a long list of domestic and international shipping services it will track—UPS, FedEx, and the U.S. Postal Service are all supported. So Amazon or eBay addicts, Delivery Status is a great choice for keeping tabs on your shipments. 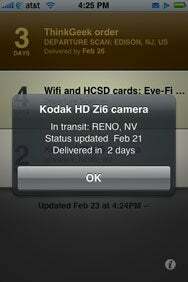 Delivery Status touch is compatible with any iPhone or iPod touch running the iPhone 2.x software update.